Given all the snowstorms we've dealt with lately, the weather this weekend has been absolutely gorgeous. Temps have been up in the mid-50s and all the snow that's been piled up over the last few weeks has started to melt. 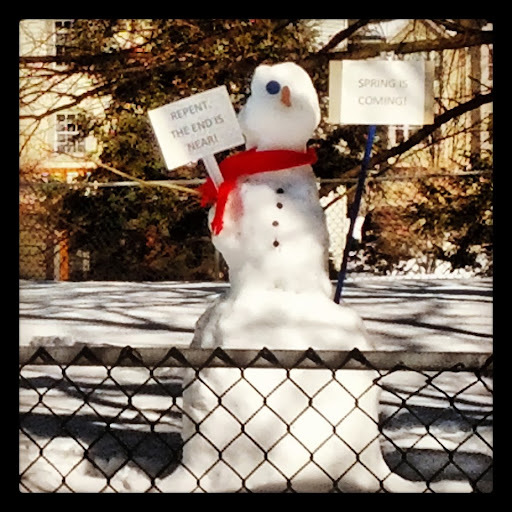 Which is why this snowman in our neighbors' yard had us laughing so hard, we actually turned around to take a picture of it. The sunshine and warmer temperatures have put smiles on our faces, and I think Stephen and I have started to shake the firm grip of winter off our shoulders. For me, it helped that I got to spend some time with friends yesterday -- coffee and lunch with my girlfriends Eudora and Kym and then dinner out with my friend Linda and her husband Matt. I loved catching up with all of them. Today, Stephen and I are going to do our usual brunch thing and run a bunch of errands before heading down to a family birthday party this afternoon. Sunshine, friends, and family all in one weekend? Glorious! Because I'm typing against the clock (we were supposed to be out the door to the restaurant ten minutes ago), here's our Menu Plan for the week without further ado. Happy Sunday, everyone!